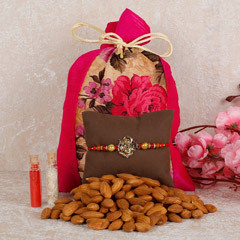 Send your love with a goodness of health to your handsome brother with your Rakhi with dry fruits to UAE. 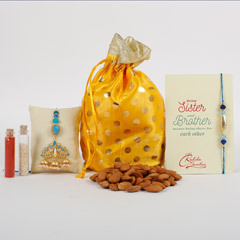 Choose from our incredible range of Rakhi gifts below to stupefy your brother with your thoughtfulness. The festival of Raksha Bandhan is an auspicious festival which describes the beautiful bond that exists between a brother and sister. 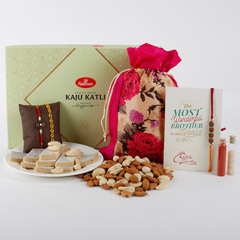 This special day is not just about the Rakhis, sweets, return gifts, but also includes healthy dry fruits in its celebrations. 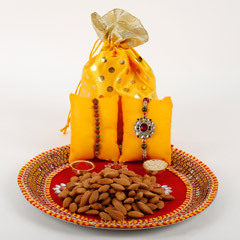 As dry fruits have been a crucial part of festive gifting in India and abroad, this amazing Rakhi with dry fruits to UAE is a wonderful gesture to wish your brother on this fantastic festival. Flowerdeliveryuae.ae has come up with incredible rakhi combos which you can send to UAE to surprise your brother on the beautiful occasion of Raksha Bandhan. 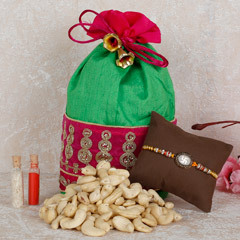 Our dry fruits in this combo come in an eye-catchy multi-colored potlis incredibly designed by our gifting experts and also accompanied by roli and rice. 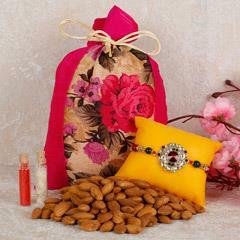 Here in this combo, you’ll find Lumba rakhis, designer rakhis, Kid’s rakhi, Rakhi sets, etc. in a variety of designs and price ranges. 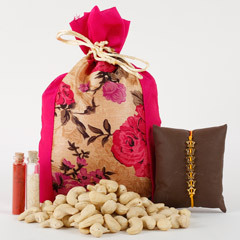 For ordering, you do not have to think much as we help you send online gifts to UAE within time. 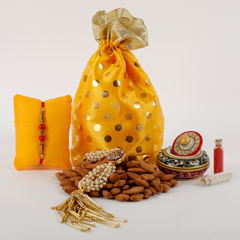 If you are looking for a portal providing Rakhi and dry fruits delivery in Dubai, then Flowerdeliveryuae.ae is certainly a recommended portal owing to its exceptional online rakhi delivery in Dubai from India. 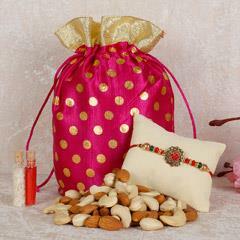 The range of rakhi with dry fruits combo is extensive while the prices of this rakhi combo are economical.